A question I often encounter when I talk with new hunters, non-hunters, and sometimes even veteran outdoorsmen about eating some of the things I have in my freezer is usually, “You can eat that? Really? How?” Oh yes…Yes, you can! I love to eat what I shoot but there are some exceptions. Although you can fillet and pressure cook carp in mason jars and make “carp cakes”, casseroles or other mealtime favorites, it’s a lot of work and there are many other fish you can eat in the world of bowfishing that seem to taste better. In fact, many species of fish we go after in bowfishing make really good table fare. Tilapia is an invasive species to our Texas rivers and lakes but they are also a fine fish to each, served in many fine restaurants across the world. After all, tilapia is readily available as a farm-raised fish in numerous fish markets nationwide and across the globe. Over the years, I have learned to fillet tilapia using the Canadian method to avoid the rib bones and cut out a fillet from each side. This is a very effective and efficient way to clean these fish. Tilapia taste great fried, baked, broiled, grilled, blackened or prepared a number of other ways. I personally enjoy grilling or baking tilapia with lemon and capers. One recipe my wife, Meagan, and I have tried is Bermudian Fish Chowder. This is a very good savory dish that you can add your own spin to and make it your own creation. Meagan wrote about this recipe in her blog. This is just a fun way to eat fish you may not have thought of before. 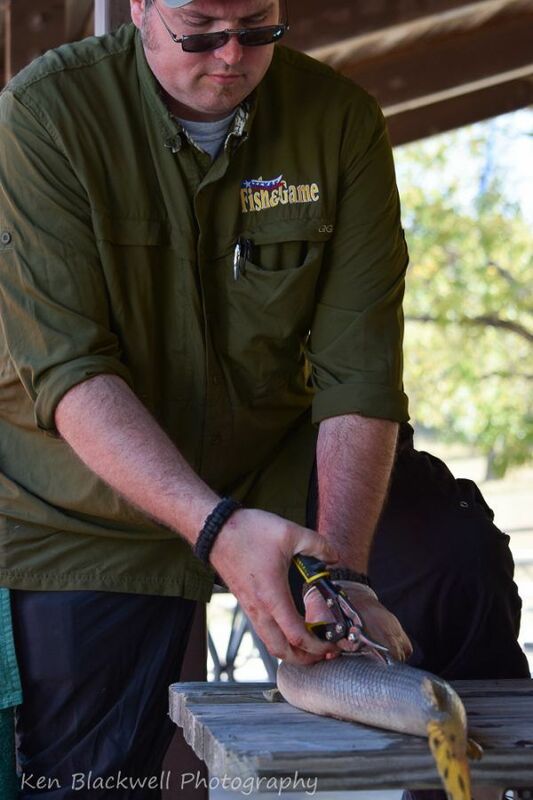 Gar fish are certainly harder to clean than many other fish but the task is fairly simple and straight forward with a pair of tin-snips (or a machete if you want to go crazy!) and a fillet knife. Simply cut through the top of the fish down the dorsal fin from the head to the tail to open up the top part of the gar’s plating. Underneath all of this are two strips of white meat which you might equate to “back straps” on a deer. Cut these boneless strips of meat out and you’re done. The author cleaning a longnose gar with tin-snips. Gar have a thick armor plating that only a pair of tin-snips or other heavy duty tool can handle. Gar can be boiled with crab or crawfish boil spices, fried, grilled or cooked a number of other ways. If you’ve never had gar before, it isn’t really “fishy” in taste and it resembles pork more than fish in texture. In other words, is not flaky like a normal cooked fish. It doesn’t have a lot of taste on its own but is tasty nonetheless. My best advice on cooking gar is to clean up all the meat before you cook it. Soak it in saltwater so it will draw out the blood. Fried gar is hard to beat. Other folks like the Cajun style gar balls. There are several variations on how to make gar balls but they are tasty either way. My friend and bowfishing guide Marty McIntyre likes to cut out the rib section from a big buffalo, separate them into individual ribs, dip in batter and deep fry. I have tried this finger food “appetizer” before and, while a delicacy to some, I am not a fan. I just wanted to write about it here so you had some other ideas of what you can do. My father-in-law often reminds me that everything is technically edible, but you don’t HAVE to eat it all! This is true. I enjoy eating what I kill or catch. It is part of the hunting or fishing experience and my adventures would not be complete without this process. There is nothing wrong with experimenting with what works for you with eating what you shoot. Please always keep in mind that just because it’s a rough fish sought after as a bowfishing target doesn’t mean it can’t be good to eat!